Pre-heat oven to 360F. 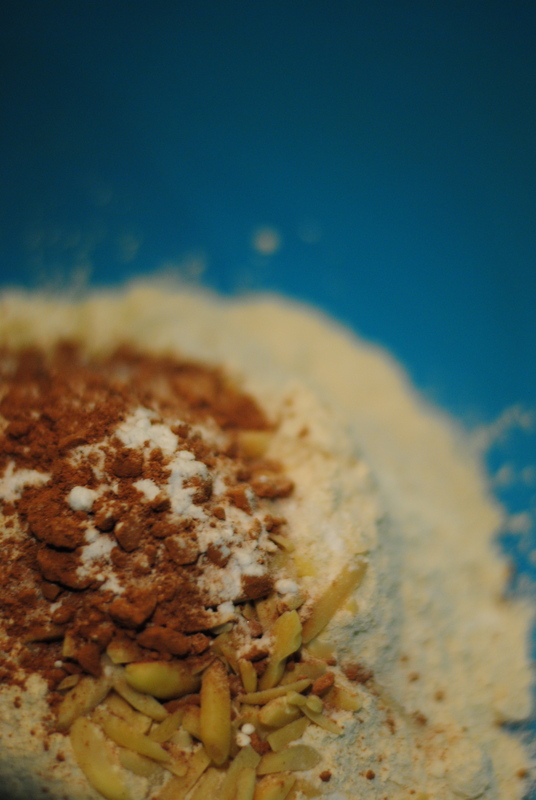 In a bowl, mix the flour, sugar, salt, sliced almonds and cardamom powder well. Set aside. Mix together the flax eggs — for each 1 tablespoon of flax seed, 3 tablespoons of water — in a separate, small bowl. Set aside. Next add softened Earth Balance, vanilla extract, almond extract, flax eggs, and olive oil to the flour mixture to make dough. The olive oil is option. I added it to give the edges of this cookie some crisp — which resulted in a fluffy inside and harder outside — like a cake bite (also a lot of butter, I know, but… that’s why it’s cake-like, too!) When you’re rolling the little dough balls, it should be very soft. 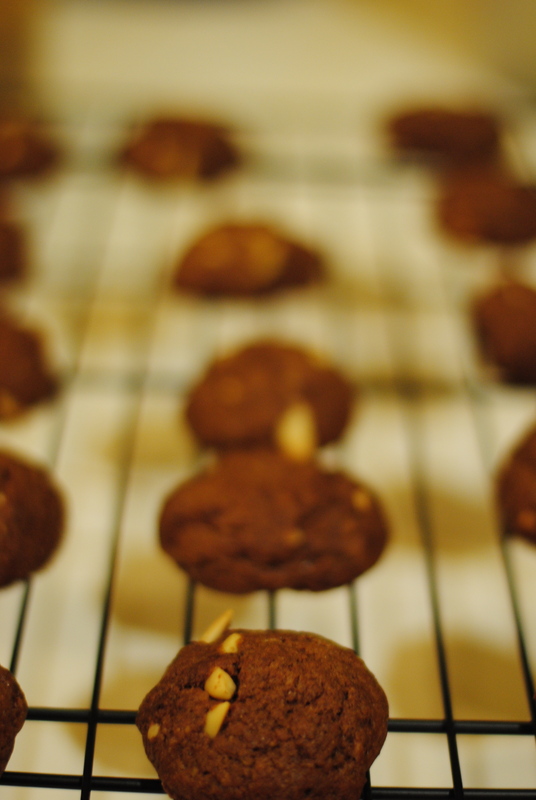 Spread them about an inch apart on a baking mat or parchment paper. 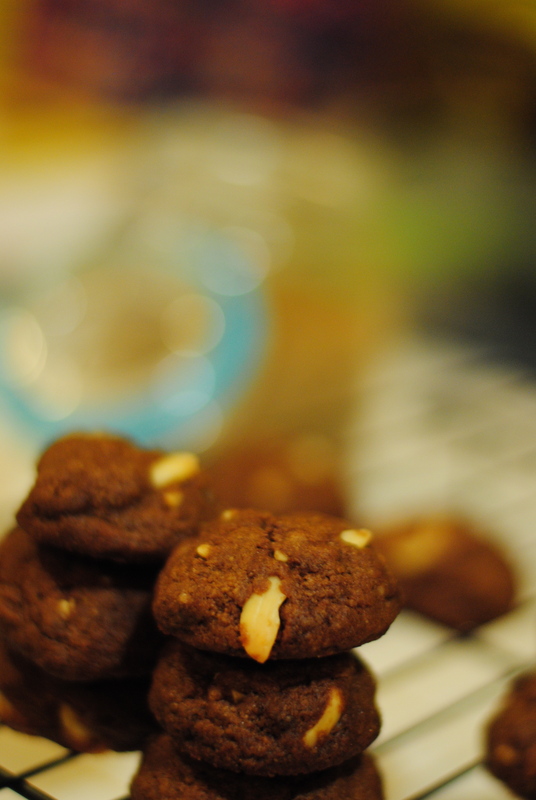 Bake the cookies for about 18 minutes or until cookies puff up and golden. Remove the cookie sheet from the oven. Let the cookies cool down for two to three minutes before taking them off the cookie sheet, then place them on a wire rack. This recipe, entirely self-created was inspired by Manjula’s Whole Wheat Eggless Almond Cookies, which is for almond spice cookies that are quite different — light and crunchy, traditionally served with tea, but I found myself excited by my ever-growing pantry and just started to add and add — chocolate, butter, flax-eggs, extra cardamom for zing. So, in some sense, I can’t say this recipe really came from anything else. This was my playful side coming out in the kitchen. So, yes, that comes in time — being able to pull recipes together off the top of your head. I’d love to hear your favorite made-up cookie recipes! Or your take on these chocolate almond spice cookie cake bites! These look really tasty. I hope to try this when I’m up for (sweet) baking sometime soon. I was busy admiring your colorful photos and then I came across the Manjula reference. I see you’re researching Indian vegan foodstuffs. Good resource! Cool that you get adventurous and vary things and go your own direction… in this case with the choco spin. Thanks! I love your blog. Your photos are great. Do you have any advice? 🙂 I’m looking forward to trying some of your recipes soon. Are you in the process of writing a cook book?